What shall we draw today? 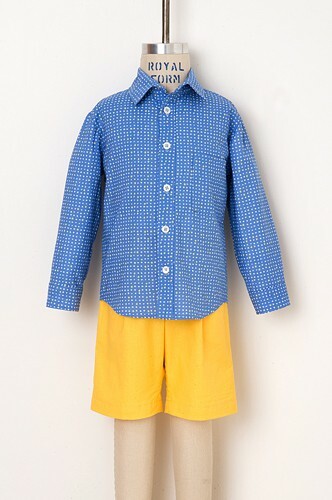 This boy's or girl's classic shirt and shorts pattern features a shirt in two versions: a cuffed, long-sleeve option with a one-piece collar and chest pocket or a band collar and short sleeve option. Both styles include button front placket and shirt-tail hem. 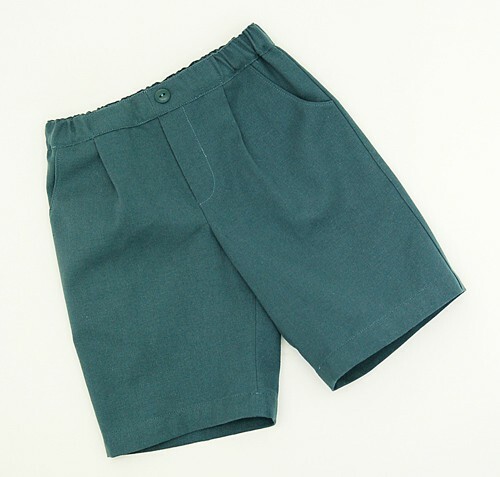 Below-the-knee length elastic-waist shorts include front pockets and mock fly. Share your photos on Instagram with the hashtags #sketchbookshirt and #oliverands. After successfully sewing this pattern, you will have developed the following skills: buttonholes, collar, flat-set sleeves, front hip pocket, patch pockets, plackets, and pleats. Shirt: Light- to medium-weight woven fabrics like quilting cotton, broadcloth, lawn, shirting, poplin, fine-wale corduroy, and linen. Shorts: Light- to medium-weight woven fabrics like denim, canvas, chambray, corduroy, twill, and linen. 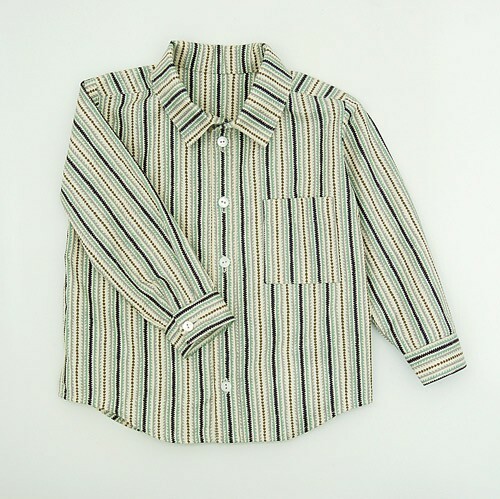 Shirt: Thread, eight 3/8" or 1/2" buttons (six for View B), lightweight fusible interfacing. Shorts: Thread, 3/4" wide elastic. Shirt Chest 23" 24" 25" 25 1/2" 26 1/2" 27 1/2"
Shirt Length* 13 1/2" 14" 14 1/2" 15" 15 1/2" 16"
Long Sleeve Length** 14 1/4" 15 1/4" 16 1/4" 17 1/4" 18 1/4" 19 1/4"
Short Sleeve Length** 11" 11 1/4" 11 1/2" 11 3/4" 12" 12 1/4"
Shorts Outseam 9 3/4" 10 1/4" 10 1/2" 11 3/4" 12 1/4" 13"
Shorts Hip, Extended 22 3/4" 23 3/4" 24 3/4" 25 1/4" 26 1/2" 27 1/2"
Shirt Chest 28 1/2" 29 1/2" 31" 32" 33 3/4" 35"
Shirt Length* 16 1/2" 17" 17 1/2" 18" 18 1/2" 19"
Long Sleeve Length** 20 1/2" 22" 23" 24 1/2" 25 1/2" 27"
Short Sleeve Length** 12 1/2" 12 3/4" 13" 13 1/2" 13 3/4" 14"
Shorts Outseam 14" 15 3/4" 16 1/2" 17" 18" 18 3/4"
Shorts Hip, Extended 28 1/2" 31 1/4" 32 3/4" 33 3/4" 35 1/2" 36 1/4"
This pattern was such a wonderful sew! The directions were awesome and my nephew loves his new shirt! Loved this pattern. I had a hard time finding patterns for Jedi outfits for my grandsons. Thanks to a lady who made the same Luke from Return of the Jedi costume using this pattern and posted it to Pinterest. I had a terrible experience with another on-line pattern company but this one was so easy. I highly recommend the Oliver+S site and would use it again. 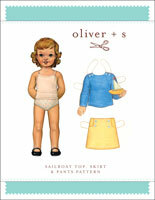 I LOVE Oliver +s patterns! The fit is great and the instructions are second to none! I have made many of their patterns and have never been disappointed. This shirt and shorts make my grandson the envy of any two-year old (parent). Have made two outfits with this pattern - because the sizing in Europe is different from USA I always go by the actual measurements rather than age and even so the not quite 4 year old just fits fine into his size 5 outfit. These patterns are easy to follow and after having made three different Oliver+S designs have no hesitation in reccommending them. My son loves his sketch book shirt! Lovely, easy pattern to follow. I love the attention to detail without making it over-complicated. I think the shirt is designed not to be tucked in and is therefore a little short. Sizing, as with most Oliver+s patterns is quite small but this suits my smaller than average off-spring. My son loves his shirt so it must feel good on as well as looking super-cute. I was looking for a basic button up shirt to make for my son. I wanted it to be like that of a men's button up with a yoked back. This one fit the bill nicely. And it went together really well too. The only thing I'd tweak next time is make the side seam longer and the hem not curve so steeply for its kinda short on my son in that area. Overall a terrific pattern for a good classic button up shirt. I made the short sleeve sketchbook shirt. I had never done button holes or collars before, but I found this pattern so easy to follow and my son loves his new shirt. I'm already planning to make more. I highly recommend this pattern. 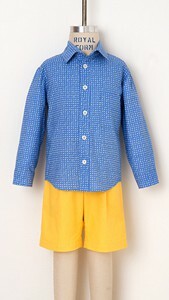 Haven't sewed it yet but plan to make it for 5yr old twin boys for school in a soft cotton. They fight about wearing stiff collared shirts!! I loved this pattern. Directions were clear and easy to follow. I hadn't made a button down shirt for a little boy and I am super please with the results. 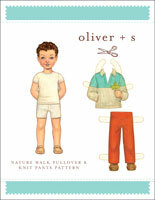 Of course, every Oliver & S pattern I've tried has been fantastic. I made a short sleeve shirt for my three year old to wear as his ring bearer outfit. Fantastic result and great pattern as always. Made a minions short sleeve sketchbook shirt for grandson (3T). Had to read the instructions a few times to get the yoke and collar together but think the instructions were very well written. I am working up courage to try the new woman's shirt pattern. This was a great introduction for me. I'm using this pattern for ring bearer clothes for spring wedding. I made size 2 and 3 sample shorts and shirt, one with collar and one with band, to send to the mom--awaiting his fitting before the final project in linen. Everything went together perfectly--directions are excellent and I love making something nice that can be handed down and will still be enjoyed by a tot (and the grown-ups in his life) years from now! I look forward to posting wedding pics in May! I've had some trouble finding a flannel shirt pattern for my young grandson and thanks to Liesl's suggestion, this one fit the bill! The directions were easy to follow. And my grandson insisted on putting it on as soon as he saw it, high praise from a two-year old! And now I'm going to use the same pattern to make a couple of Hawaiian shirts for summer. Thank you, Oliver + S! I made the shorts into pants by just addin length. This is a wonderful pattern. I love the flat front band. I will make shirts soon for my grandson. Thank you! I just be able to make the shirt and by far I've made 2 already in a month. This pattern is my thirs attempt to sew and the first shirt I've ever made. The instruction is very clear and help me as a beginner not only be able to sew a shirt for the first time but also give us the tricks for the best result. I have only made one of this pattern so far, but another is cut and ready to go on the sewing table. Made a monster shirt for son's first birthday. Easy to use and we'll written, as always. I know that I can easily use any of your patterns and have it come out great. Thank you for your time, care and attention to detail. Since downloading this pattern a month ago I have sewn 3 shirts and one pair of shorts and I love the pattern! Digital is so convenient because I can cut the sizes for each child and not mess up the original. I found the sizing fairly good for my children, although I have to add 1 or 2 inches to the shirt length because they are both long in the back. I would say that the shirt is generous in "volume" and I used a Hawaiian type print for my 8 year old daughter. Definitely not a formal look on a girl! I love the comprehensive instructions that Oliver and S always provide, which meant I was able to make my first shirt without any difficulty. I was surprised though that there was no mention of swapping the sides of the buttons and buttonholes if sewing for a girl. The shorts sewed up nicely for my son. Again the cut is generous and long in length, quite casual.I wasn't sure if I'd want another shorts pattern as I love the free Sunny Day Shorts, but these are different enough to be worthwhile. I made the short sleeve pointed collar version for my nephew as a 1st birthday present, and it was a hit! My SIL asked me to make another one for him. I used snaps instead of buttons because they were easier for me to put in and easier for his parents to dress him in. I felt like a sewing rockstar when I finished the collar. One reason I bought this pattern was to dip my toes into shirt sewing - now I feel confident enough to attempt a button-up for myself or my husband! I have sewn two of these shirts and they are very cute! The yoke instructions were confusing for someone who has never done it before and neither of my collars matched up right so I had to cut fabric off and size down. I would also rate this pattern 3.5 out of 4, not 2 out of 4 like it's rated. Between the plackets, yoke, collar, and buttonholes this is a difficult sew that takes a couple hours. The instructions are wonderfully written and the pattern goes together smoothly. As others have said, the shirt is a bit short, so I lengthened the size 4 by 2inches based on my little guy's measurements. Fits beautifully after this simple change. I loved sewing up this shirt for my little guy. I had never attempted a collar or placket outside of my highschool sewing class (under lots of guidance!) and found the instructions to be very helpful and clear. great pattern overall, I did find that it fits quite large so my son's birthday shirt will have to wait until this summer to fit! I made size 3 shorts for my grandson who has just turned 2. They went together easily - I used stretch denim - and met the approval of his parents! They were a little big for him and I think next time I will narrow the legs a bit but all, in all, a great pattern. Shirt easy to make and looks great. I made a first day of kindergarten shirt the day before, thinking it would be a quick sew, which for the most part was, however, the yoke instructions left me in tears over my ironing board for about an hour! I didn't think to email asking for help, I just googled instead, and eventually found a YouTube video of another method that was super simple to understand. Only other issue is that the shirt is way too short and wide on my son who is super skinny and also a few inches short for his age. It's a 5t and fits my 3 year old better than my 5 year old. Now that I've figured out the yoke, I plan to make many more. But a more detailed tutorial on yoke instructions would be super helpful!! And add a few inches to the length!! I truly love this pattern. I made the short sleeve shirt with the collar. Together with the bermudas the outfit came out really nice and both the parents of the boy I made it for as well as the boy (4 years) loved it! I will make this many times more. I've only had this pattern a month and have already sewn the shirt twice, using the pointed collar and short sleeves to knock up a couple of cotton shirts for my nephew. I found the instructions quite thorough. I struggled a bit envisioning how the yoke came together, but when I thought about what I was trying to achieve and followed the instructions step-by-step, it worked well. Like several other reviewers I found the shirt too short, so on the second one I lengthened it by 5 cm. I was a little disappointed that my 6-year-old nephew measures between a 7 and 8, as I think he may outgrow the pattern before either of us are ready. I also didn't consider, until it was too late, that a distinctive, clear print isn't the best fabric for this shirt as the button placket is difficult to pattern match across, so that is something I'll take into account next time I sew this, and there will definitely be a next time. I've only sewn the shirt, but I've sewn two of these classy little butyon downs. This a well drafted, written and illustrated pattern. I did find the original sizing to be short and wide for my 2 yr old son. He is string bean, so this is often the case with patterns and RTW items. For him, I made a 18-24m width and a 4t length. I can imagine the length might be a bit short for a normal sized kid, but that's a minor adjustment to make. My only issue with this pattern is the collar. The lack of collar stand looked too "homemade" to me, so I drafted one up myself. Other than that small detail, this is a great pattern. I'm sure the pants are adorable, too, I just haven't made them yet. Couldn't understand yoke instructions as never done ins before. Emailed to ask for a tip and was told to ask someone in a forum, which meant an un-successful hour trying to create an account just to ask for help from other customers. Would've appreciated better customer service. Ended up using an un-related utube clip to teach myself how to do it. Disappointing considering the pattern price. Will stick to etsy from now on which has never failed on customer support. I love this pattern. Easy to follow, goes together beautifully and has a professional look. I made both views and am starting on my 3rd shirt. I love both views. The shorts are wonderful and go together easily. Highly recommend this pattern.. The good: The pattern printed out and went together easily. Instructions are clear. Love the button placket and finished yoke - very professional looking. Not so good: My son is a size 8, but I ended up making a size 10 for him, based on measurements. The fit of the size 10 shirt is good, but I wish it were a little longer. Next time I make it, I will probably add an inch to the length. The little shirt was very detailed yet had easy to follow instructions. I will definitely be making this shirt again! Two suggestions. 1) sew the topside collar rather than the underside first for a more professional looking finish. 2) the view b is a mandarin like collar and I was hoping for the more triangle variety (view a). the pattern view did not clearly show this difference in neckline. Yes. I love it. However, I do wish it were more affordable and I hope that in the future, there are more boy patterns. Girl patterns overrun the entire pattern industry :( I grab boy patterns wherever I can due to the fact that they are so rare. This is my second copy of the Sketchbook shirt, I wore out the first one! As always, a workhorse pattern that I used for our son's Christmas show shirt, long sleeves and band collar options. I sewed the Sketchbook Shirt (long sleeve, size 2T) for my godson for Christmas. This is the first time I've made a button-down style shirt, and I was expecting it to be a little tricky. The pattern was very easy to follow, though; it made the whole thing very straightforward. I love how the shirt came out, and I'm planning short-sleeve shirts for him for spring! It would be nice to have had a reference of what pages to print for each size, however. The way the collar pieces were tiled confused me so much that I decided to print out all the pattern pieces. I ended up wasting a fair bit of paper; a reference list could help avoid this minor issue. All-around a great pattern, though. The following errors were identified in the first printing of the paper version of this pattern. All of them have been corrected in the digital version now available. On both size ranges in the first printing, the cutting layout for view B includes piece #9, the Sleeve Placket, which is only needed for view A. In the first printing, please note that piece #13, the Shorts Back, is missing seam allowances for sizes 6, 7, 8, 10 and 12. (Other sizes are not affected.) This is easy to remedy: draw a line 1/2" from the printed cutting line to create a new cutting line, as shown below. 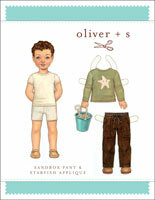 In the first printing, for sizes 6-12M, 12-18M, and 18-24M, pieces #13, #14 and #15 are missing seam allowances. Add 1/2" from the printed cutting line on each of these pieces as shown in the illustration above. In the first printing on the size 6M-4 pattern sheet, piece #4, the Shirt Yoke, has size lines with incorrect labels at the neck and shoulder edge. The piece should read as follows. In the first printing, on the size 6M-4 pattern sheet, piece #11, the Short Sleeve, has size lines with incorrect labels at the lower edge. The piece should read as follows. In the first printing, on the size 5-12 pattern sheet, piece #1 has size lines with incorrect labels on one side. The inner-most line should be labeled Size 5. The size labels printed in two other locations on this pattern piece are correct. Discussion on the digital sketchbook shirt + shorts sewing pattern from the Oliver + S Discussion Forums. Find and share more photos on Instagram using the hashtags #sketchbookshirt and #oliverands.